My girlfriend Cara introduced this little concoction to me. It sounds a little odd and is probably not for everyone but this pregnant lady eats it a lot... in fact I took this photo a while ago and when I decided to post it today I thought "gosh... that sounds good... maybe I will eat one while my photo is uploading." I am quite satisfied to enjoy this for lunch and even a side dish to a throw-it-together dinner. 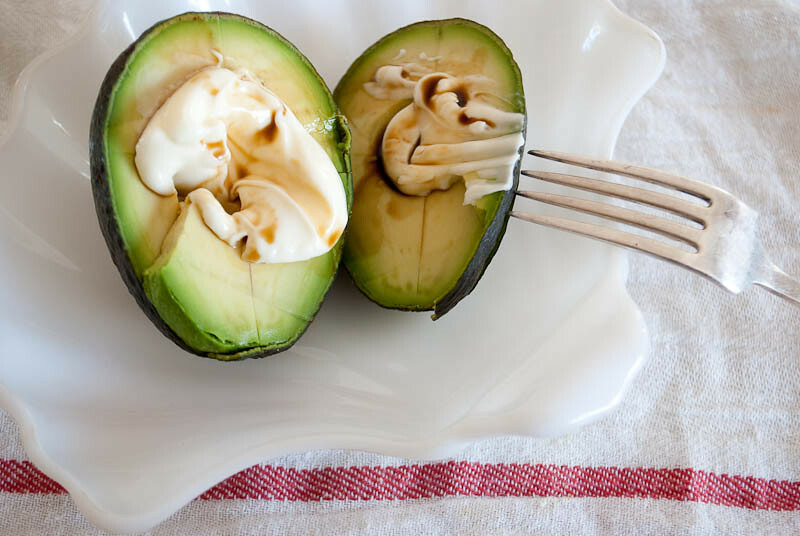 Cut an avocado in half, take out the pit, give a spoonful of mayo for each half, shake on some Worcestershire and give it a good helping of pepper. And for the winner of the lovely Jeanne Oliver tote, it goes to Paige, you are it! Lucky lady. Avocados are one of my favorite things in life but I hate Brazilian avocados, the are way too watery and bland. Ack! Those on the other hand. Love perfect and delicious. I like avocado sandwiches with mayo and salt, but not sure I could do this! Maybe I'll have to give it a try. Have a great weekend! I make all kinds of things with avocados from sauces, dips, smoothies, ice cream, you name it, they are a glorious food. I love what you made (I also adore mayo, well vegenasie and miracle whip too)...yum! Paige is one lucky lady! I do love avocados but I'm not sure how I'd feel about mayo and Worcestershire sauce like this. But I trust you, so if you say it's good, I'm willing to at least try. I don't love mayo, but this looks good! I'll try it! Happy Friday! Whee! Now of course I've gotta have one too! Don't forget to put plenty of pepper on it, that's the ticket for me (original recipe is not mine but my Father-in-Law's - thanks Tyler!). It's from back when the only thing you dressed a salad with WAS mayonnaise! p.s. with homemade garlic mayo (see julia's) it hits the stratosphere...but who has time for that?! Oh my goodness...if I had a ripe avocado...I would make this right now! It looks beyond delicious! But then you could even make raw chicken look beautiful! this looks amazing! i make a similar dip for artichokes. mayo + worcesteshire + tabasco + lemon juice. I think you know why this makes me smile. Those look yummy! I am super excited! I would question this coming from anyone else, but I totally trust you. The combo doesn't sounds so good to me, the picture has me sold. I will have to give it a try.